A former Crown Prosecution Service finance manager and her partner have been jailed for making bogus expenses claims worth more than £1m. Lisa Burrows, 41, and Tahir Mahmood, 50, a taxi driver who also worked for the CPS, admitted producing invoices for a fictitious taxi firm. Burrows, from Oldbury, and Mahmood, from Hodge Hill, Birmingham admitted conspiracy to defraud. They were jailed for six years each at Birmingham Crown Court. 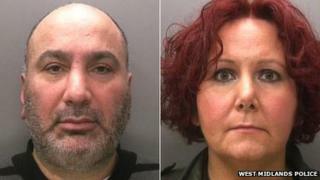 The pair, who were arrested in February, admitted the name of their bogus firm, B&M Taxis, stood for Burrows and Mahmood. The court heard they "operated as a team" to defraud the CPS of £4,000 a week over five years by lodging claims for non-existent taxi journeys. Burrows and Mahmood - who met in an internet chat room - used the proceeds of the fraud to fund holidays to Dubai and New York, as well as splashing out on designer handbags, clothing and jewellery, the court heard. Mahmood told police he had used £20,000 as a deposit to buy a house and once spent £10,000 during a week on holiday. Prosecutor Brian Dean said Burrows, who earned £24,000 as a regional finance manager at the CPS offices in Birmingham, embarked on the fraud in 2008 shortly after meeting Mahmood. She realised the CPS spent considerable sums on taxis and later got the taxi driver a job as an apprentice with the CPS. "She then decided, along with Mr Mahmood, to exploit that by making false claims for non-existent journeys," he said. "Mahmood played a full and significant role in the conspiracy in the initial planning of the fraud. "He withdrew nearly £1m in cash over five years, most of which is still unaccounted for." Burrows submitted bogus invoices for a total of £1,021,475 between early 2008 and February 2013, the court heard. She paid more than £320,000 of cash into her bank account and claimed it was Mahmood who had suggested the fraud, the court heard. At an earlier hearing, the court was told Mahmood opened bank accounts using a different surname to facilitate the fraud. Detailed investigations into the fraud, which went unnoticed despite four annual audits, failed to trace more than £660,000 of stolen public funds, the court heard. Judge William Davis QC said: "It was you, Burrows, who created and then authorised the payment of the bogus invoices. You knew how the system worked. "The fact that the fraud involved the CPS and was committed by a senior member of that service - the body responsible for bringing criminals to justice - will have affected and eroded public confidence. "It is difficult to imagine a more serious fraud of its type."